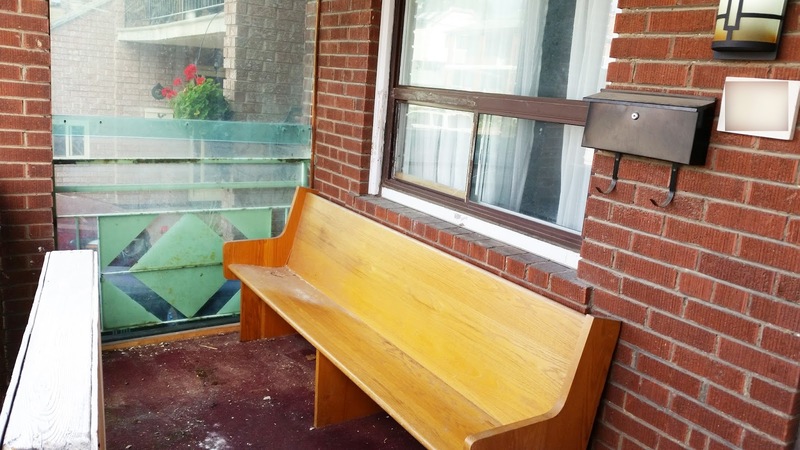 Who remembers how ugly our porch was? Yikes! It was so bad that I loved Halloween because it already looked so dilapidated and scary. 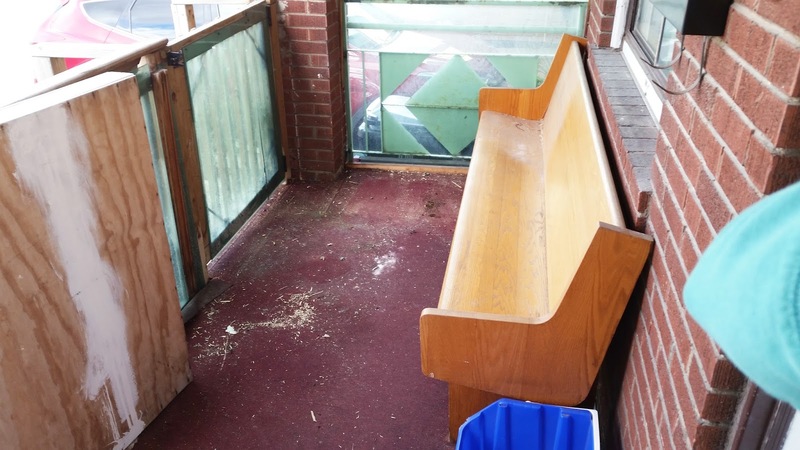 I hated everything about it from the treacherous steps and the upside down door to the tattered burgundy carpet and the green plastic wind shield on the side. We have been wanting to enclose it since we moved in, but we finally hired a contractor to do it this fall. I'm so excited to share the finished product with you guys but I'm going to split the posts and just focus on the exterior today. 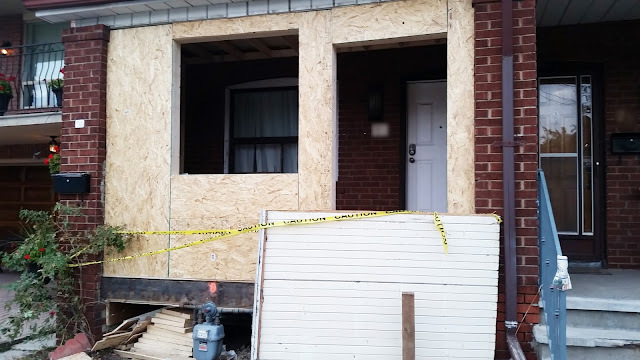 It was a really involved process, which involved replacing our old door and window, reinforcing and insulating the porch, enclosing the space, finishing the interior, having a new exterior door and window installed, bricking the exterior and building a new landing and stairs. 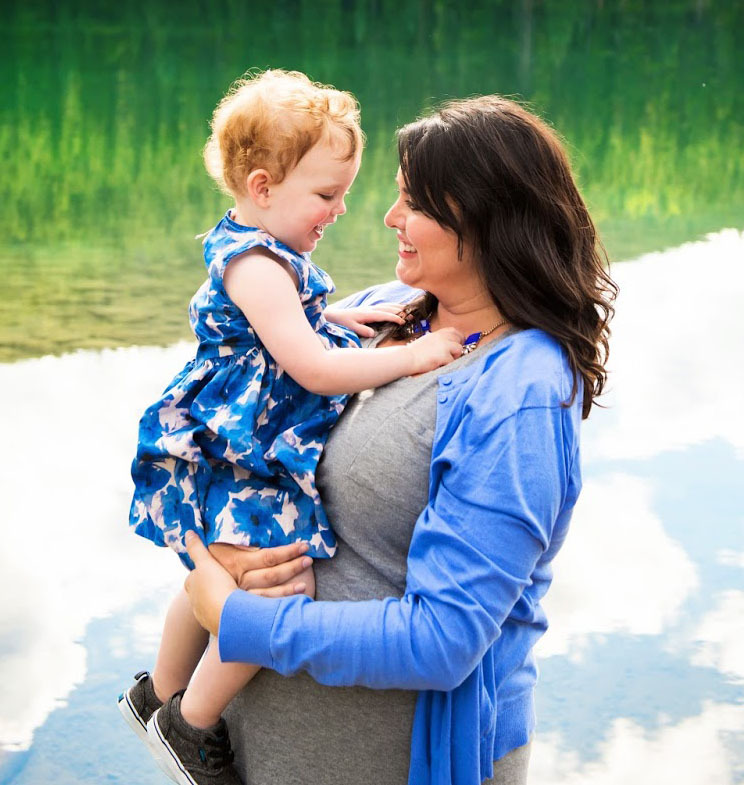 When we first met with out contractor, we had no idea how many decisions we'd have to make. 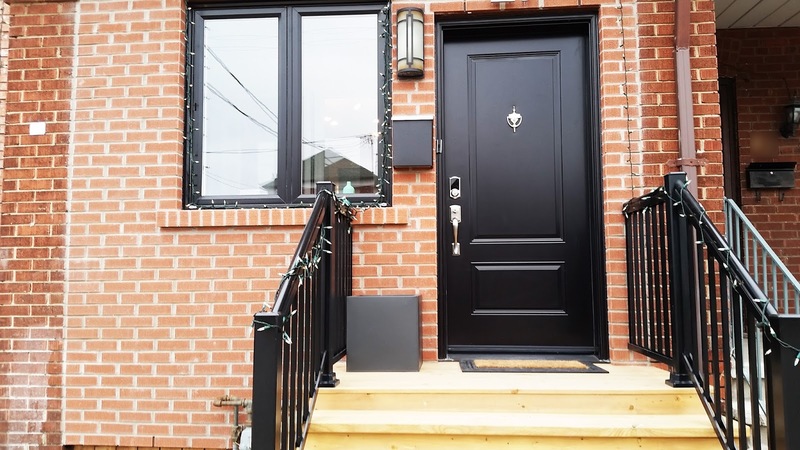 We knew we'd get to choose the doors but we ended up having a lot of opinions about things like the width and material for the stairs, the size of the new exterior window, the size of the interior closet, the brick for the new exterior and even the colour of the window frames. 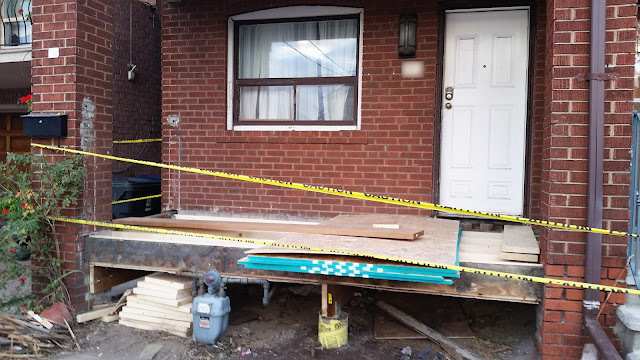 Here's a look at our sad old porch to give you some perspective. Obviously, we've been excited for this overhaul for a while but there were so many details to consider. We actually had a decent amount of space to work with (once we got rid of the church pew) and I'll show you what we did with it when I post about the interior. 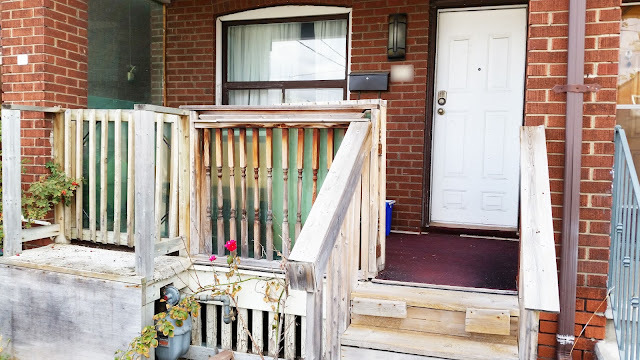 After living with our crummy upside down door for two years, we were excited at the prospect of getting to choose new doors for both the exterior and the interior. We chose an interior door with lots of glass to let some natural light in to our narrow hallway. 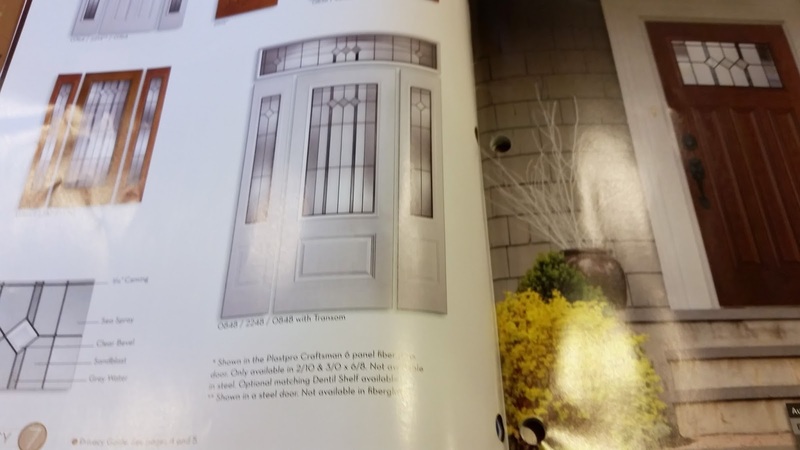 For the exterior door, I wanted something solid and elegant looking. We opted for black because it matches everything. When the project began, we were so excited to finally be improving this eyesore. We spoke with our contractor at length about how to finish the exterior of the porch. He suggested flagstone, which has become very popular. Our tastes are more traditional though and we asked him to try to find a close match to our existing red brick. Our reasoning being: It's an old house. Let it look like an old house! When the walls went up, Corey and I would stand there in the evenings and toast with a glass of wine because we were so excited about our new space! Our neighbours must think we're crazy drunks! 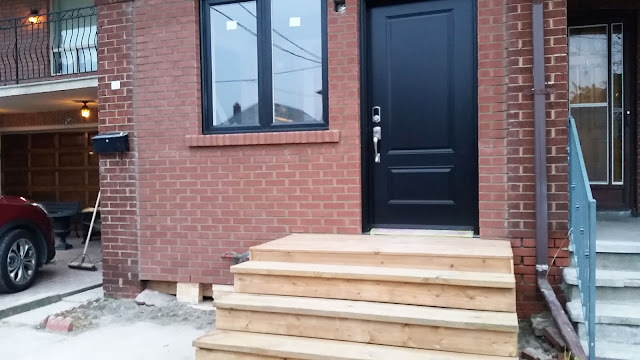 Our contractor made a big push to get the steps installed for Halloween so that we could still entertain trick-or-treaters. As you can see, I had wanted extra wide steps. I picture us taking first day of school photos of our children on those steps. Now that the railings are in, the job is done. I've found the perfect planter for our landing, which we can now decorate according to the season and eventually, Corey will power wash the old brick to see if we can get it looking more like our new brick. I'm excited to show you what we've done with the interior, but I'll save that for another post!